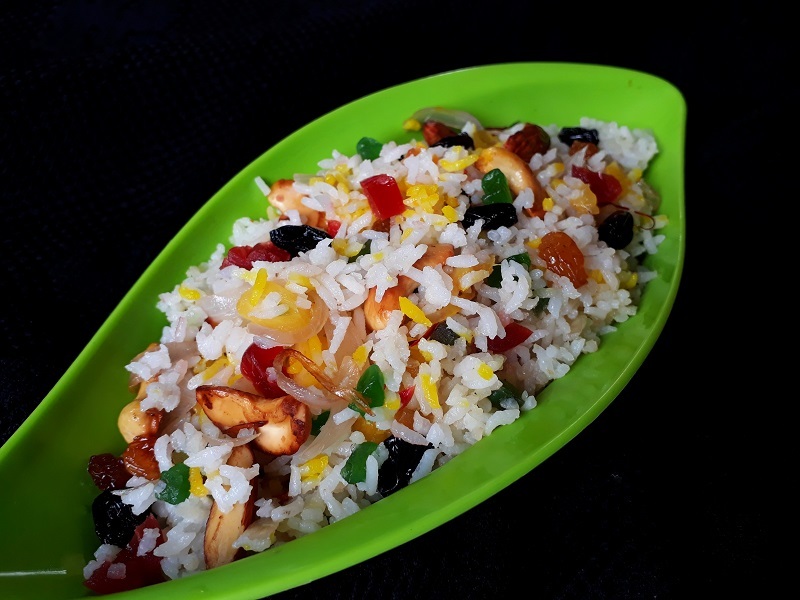 Kashmiri pulao is a tempting pulao with sweets and very few spices. Its also a healthy and sweet lunch idea. I think all kids like this very much, so that we can make it a lunch box food for our kids. 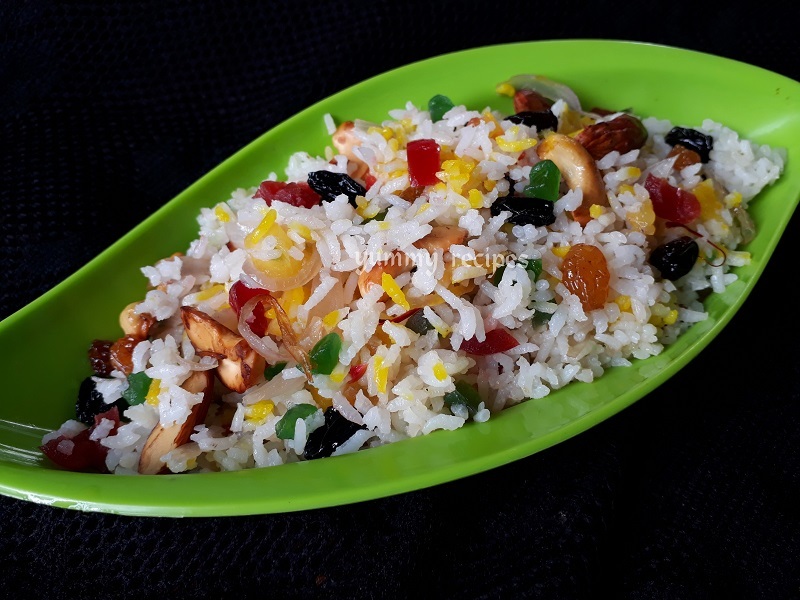 for making this kashmiri pulao you can always use grapes, pomegranate seeds, apple and soaked saffron that you have. Serve it with tomato gravy or any vegetable gravy. 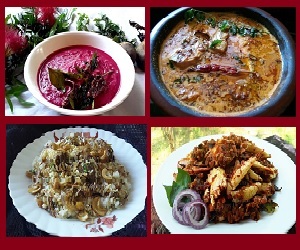 Lets see the making of kashmiri pulao with detailed images and video. Please do try and send your feed backs in comment box. 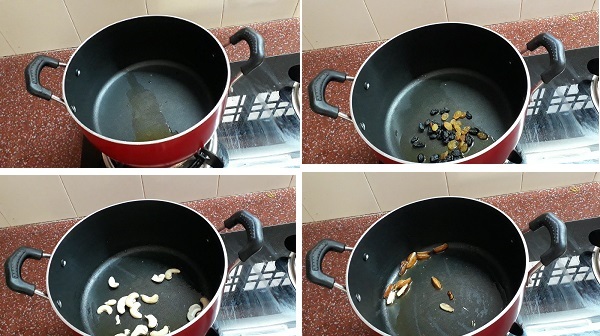 Heat ghee in a deep bottom pan, fry all the dry fruits and keep it aside. In the same pan add cloves and cinnamon, just sauté it. Then add sliced onions and very little salt, sauté till the onion turns soft. Add tuty fruity, cherries and chopped pineapple and sauté it for 2 minutes in medium flame. Now add cooked rice and combine well. You can also add very little sugar in it. It’s optional. 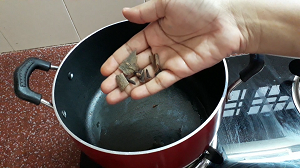 Finely sprinkle the fried dry fruits. 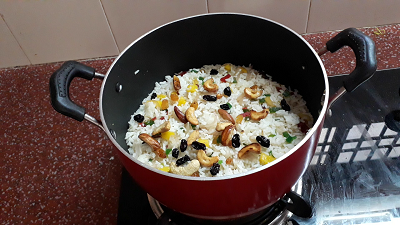 The tasty and sweet rice is ready to serve.